Yippee, finally a no-brainer restaurant opens in the Marina. Looking for tasty salads for lunch with the girls? 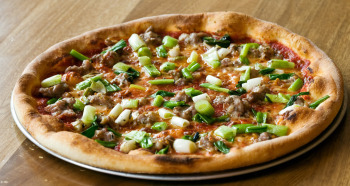 Jonesin’ for a perfectly crisped Roman-styled pizza? Date night? Only have time to grab a brew and some apps before the movie, or wine and dessert after? 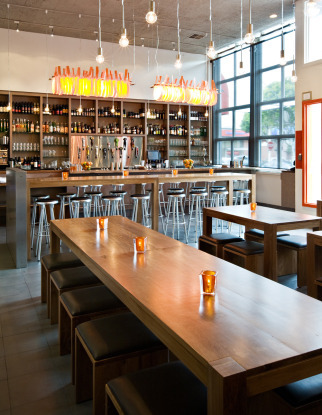 Chestnut street’s newest hot spot, Delarosa, is your go-to place for all of the above, plus the food is really good! The latest offering from the Baretta and Starbelly restaurateurs, this causal Italian eatery is open daily from 11:30 a.m. – 1 a.m. They only have one menu but it’s a doozy, with an extensive selection of antipasti, salads, pizza, pasta, sandwiches, spiedini (grilled skewers) and desserts. Your choice of libations also runs the gamut, from a drinker’s dozen of perfectly hand-crafted cocktails to about 30 artisanal beers and an Italian-centric wine list. They also offer complimentary sparkling or filtered still water with your meal-how civilized. 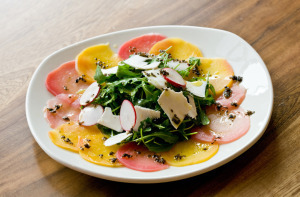 Standouts from our tasting dinner included my new fave salad of the year, an artistically plated carpaccio of gold and red beets with goat ricotta, perfectly anointed with a splash of truffle oil…yummers! I could have killed for some bread to sop of the leftover spicy marinara sauce from the meatballs (the meatballs were only ok, but that sauce was something special.) The winter chicories with cauliflower and roasted hazelnuts was another styling way to make sure you get your five-a-day. Just to test their listening skills, we made a couple substitutes on a pizza, changing the cheese, adding an egg just on one side and requesting it very well crisped and they scored an A+. About the only dish that didn’t work for me was their signature black olive gnocchi with rock shrimp–too bland and not al dente enough for me. But hey, the couple next to me scarfed down every last bite. Our charming and ever so helpful server, Jacqueline, insisted that the bomboloni caldi (hot homemade donut holes sided with three dipping sauces) were well worth every calories and I’m so glad we heeded her advice. I wouldn’t kick the coppa mocha (coffee gelato topped with choco sauce, bourbon, and crunch almonds and meringue) out of bed either.